American Snacker Snack Gift Box for sale. Buy online at Zingerman's Mail Order. Gourmet Gifts. Food Gifts. Ridiculously delicious snacks, salty and sweet, from some of our favorite American food makers. The perfect variety of nosh to see you through lazy days on the lake or long nights on the road. Nothing's too perishable. Great for camping trips, hikes and picnics. 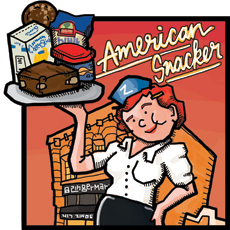 Our cartoon gift box includes Zingerman’s Butter Toasted Peanuts, John Macy’s Cheesesticks, Ann Arbor Tortilla Chips, a No-Nut Black Magic Brownie, Ginger-Jump Up Molasses Cookie, Zingerman's Sea Salt Potato Chips, and Zingerman's Spiced Pecans.